Portrait of Satie by Valadon. Eric Alfred Leslie Satie (Honfleur, May 17, 1866 – Paris, July 1, 1925) was a French composer, pianist, and writer. Dating from his first composition in 1884, he signed his name as Erik Satie, as he said he preferred it. He wrote articles for several periodicals and, although in later life he prided himself on always publishing his work under his own name, there appears to have been a brief period in the late 1880s during which he published articles under the pseudonym, Virginie Lebeau. Satie introduced himself as a "gymnopedist" from 1887, shortly before writing his most famous compositions, the Gymnopédies. He also referred to himself as a "phonometrograph" or "phonometrician," meaning "someone who measures and writes down sounds" — he preferred this definition of his profession to "musician," after having been called "a clumsy but subtle technician" in a book on contemporary French composers in 1911. Some view him as a serial precursor, being ahead of many twentieth century avant-garde artistic ideas. It is possible that, due to his religious nature and interests; serious and witty at turns, a heart-broken and hermit-like existence, his work attained that intense purity and child-like simplicity that reverberates in the listener. 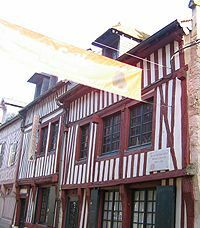 Satie house and museum in Honfleur. Erik Satie's youth was spent alternating between Honfleur, Basse-Normandie, and Paris. When he was four years old, his family moved to Paris, his father (Alfred), having been offered a translator's job in the capital. After his mother (born Jane Leslie Anton) died in 1872, he was sent, together with his younger brother Conrad, back to Honfleur, to live with his paternal grandparents. There he received his first music lessons from a local organist. When his grandmother died in 1878, the two brothers were reunited in Paris with their father, who remarried (a piano teacher) shortly afterwards. From the early 1880s onwards, his father, started publishing salon compositions (by his new wife and himself, among others). In 1879, Satie entered the Paris Conservatoire, where he was soon labelled untalented by his teachers. After being sent home for two and a half years, he was re-accepted in the Conservatoire at the end of 1885. Being unable to make a much more favorable impression on his teachers, he finally resolved to take up military service a year later. This didn't last very long. Within a few weeks he tried to leave the army, through trickery, which eventually succeeded. In 1887, he left home to take up lodgings in Montmartre. By this time he had started what was to be a long-lived friendship with the romantic poet Patrice Contamine, and had his first compositions published by his father. He soon integrated with the artistic clientèle of the café-cabaret Chat Noir (Le Chat Noir), and started publishing his Gymnopédies. Publication of compositions in the same vein such as Ogives and Gnossiennes followed. In the same period, he got to know the composer, Claude Debussy. He moved to a smaller room, still in Montmartre (rue Cortot N° 6) in 1890. By 1891, he was the official composer and chapel-master of the Rosicrucian Order (Ordre de la Rose-Croix Catholique, du Temple et du Graal), headed by Sâr Joséphin Péladan, which led to compositions such as Salut Drapeau!, Le Fils des étoiles, and the Sonneries de la Rose Croix. By mid-1892, he had composed the first pieces in a compositional system of his own making. Fête donnée par des Chevaliers Normands en l'Honneur d'une jeune Demoiselle had provided incidental music to a chivalric esoteric play, "Prélude du Nazaréen." His first musical hoax was published (announcing the premiere of Le Bâtard de Tristan, an anti-Wagnerian opera he probably never composed). He had broken away from Sar Josephin Péladan, starting that autumn with the Uspud project, a "Christian Ballet," in collaboration with Contamine de Latour. While the 'comrades' from both the Chat Noir and Miguel Utrillo's "Auberge du Clou" sympathized, a promotional brochure was produced for the project, which reads as a pamphlet for a new esoteric sect. Satie started an affair early in 1893 with Suzanne Valadon, known for her work as a model for numerous artists including Edgar Degas, Renoir and Henri de Toulouse-Lautrec. She became a successful artist and long-time friend of tavern owner Miguel Utrillo y Morlius. After their first night together, Satie proposed marriage. There was no marriage, but soon Valadon moved to a room next to Satie's at the Rue Cortot. Satie became obsessed with her, calling her his Biqui, and writing impassioned notes about "her whole being, lovely eyes, gentle hands, and tiny feet." During their brief relationship, Satie composed the Danses Gothiques as a kind of prayer to restore peace of mind and Valadon painted a portrait of Satie, which she gave to him. After six months she moved away, leaving Satie broken-hearted. Afterwards, he said that he was left with nothing but an icy loneliness that fills the head with emptiness and the heart with sadness. Apparently, this would remain the only intimate relationship Satie ever had. In the same year, he met the young Maurice Ravel for the first time, Satie's style emerging in the first compositions of the youngster. One of Satie's own compositions of that period, the Vexations, was to remain undisclosed until after his death. By the end of the year he had founded the Eglise Métropolitaine d'Art de Jésus Conducteur (the Metropolitan Church of Art of the Leading Christ). As its only member, in the role of "Parcier et Maître de Chapelle" he started to compose a Grande Messe (later to become known as the Messe des Pauvres), and wrote a flood of letters, articles and pamphlets showing off his self-assuredness in religious and artistic matters. For example, he applied for membership at the Académie Française twice, leaving no doubt in the application letter that the board of that organisation (presided by Camille Saint-Saëns) as much as owed him such membership. Such proceedings, without doubt, helped to destroy his popularity in the cultural establishment. In 1895, he inherited some money, allowing him to have some more of his writings printed, and to change from wearing a priest-like habit to being the "Velvet Gentleman." By mid-1896, all his financial means had vanished, and he had to move to cheaper lodgings, first at the Rue Cortot, to a very small room, and two years later (after he'd composed the two first sets of Pièces froides in 1897), to Arcueil, a suburb some ten kilometers from the centre of Paris (in the Val-de-Marne district of the Île-de-France région). At this period, he re-established contact with his brother Conrad (in much the way Vincent Van Gogh had with his brother Theo) for numerous practical and financial matters, disclosing some of his inner feelings in the process. For example, from his letters to his brother, it's clear that he had set aside any religious ideas which were not to return until the last months of his life. Satie used humor very often to indicate his many strong views. From the winter of 1898–1899, Satie could be seen, as a daily routine, leaving his apartment in the Parisian suburb of Arcueil to walk across Paris to either Montmartre or Montparnasse, before walking back again in the evening. It appeared that he did not completely reject Romanticism and its exponents like Wagner) since he had become more moderate; however, he rejected certain aspects of it. Musically, what he rejected most, from his very first composition to his very last, was the idea of musical development, or the intertwining of different themes in a development section of a sonata form. This naturally made his works, especially his contrapuntal ones very short, e.g., the "new, modern" fugues do not extend further than the exposition of the theme(s). Generally he would say that he didn't think it permitted a composer to take more time from his public than strictly necessary, certainly avoiding being boring in any way. Also, Satie appears to have succeeded quite well in staying clear of the art of melodrama, in its historical meaning of the then popular romantic genre of "spoken words to a background of music." Yet his 1913 Le Piège de Méduse could be seen as an absurdistic spoof of that genre. In the meanwhile, some other changes had also taken place. He had become a member of a radical socialist party, had socialised with the Arcueil community and been involved in the "Patronage Laïque" work for children, and changed his appearance to that of the 'bourgeois functionary' (with bowler hat, umbrella, etc.). Also, instead of involving himself again in any kind of medievalist sect, he channelled these interests into a peculiar secret hobby. He maintained a collection of imaginary buildings (most of them described as being made out of some kind of metal), which he drew on little cards. Occasionally, extending the game, he would publish anonymous small announcements in local journals, offering some of these buildings (e.g., a "castle in lead") for sale or rent. 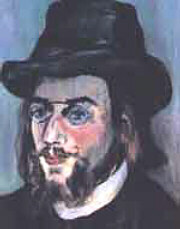 Selfportrait of Erik Satie. The text reads (translated from French): Project for a bust of Mr. Erik Satie (painted by the same), with a thought: "I came into the world very young, in an age that was very old"
From this point, things started to move very quickly for Satie. First, there was, starting in 1912, the success of his new short, humorous piano pieces. He was to write and publish many of these over the next few years (most of them premiered by the pianist Ricardo Viñes). Compositions such as the Véritables Préludes flasques (pour un chien) or "Genuine Flabby Preludes (for a dog)"), the Vieux sequins et vieilles cuirasses or "Old Sequins and Old Breastplates"), the Embryons desséchés or "Dried up Embryos"), the Descriptions Automatiques, and the Sonatine Bureaucratique (a Muzio Clementi spoof), etc., all date from this period. His habit of accompanying the scores of his compositions with all kinds of written remarks was now well established (so that a few years later he had to insist that these not be read out during performances thus avoiding the "Melodrama" genre. He had mostly stopped using barlines by this time. In some ways these compositions were very reminiscent of Rossini's compositions from the final years of his life, grouped under the name Péchés de Vieillesse; Rossini also wrote short, humorous piano pieces like Mon prélude hygiénique du matin or Dried figs, etc., and would dedicate such pieces to his dog every year on its birthday. These pieces had been performed in the Rossinis' exclusive salon in Paris some decades earlier. In all probability, however, Satie hadn't seen or heard any of this music when he was composing his own piano music in the first decades of the twentieth century since the Rossini piano pieces had not yet been published at that time. It is said that Diaghilev discovered the manuscripts of these Rossini pieces around 1918 in Naples, before staging La Boutique Fantasque. This was about the same time that Satie stopped writing humorous comments on his scores. But the real acceleration in Satie's life didn't come so much from the increasing success of his new piano pieces. It was Ravel who (probably unknowingly) triggered something that was to become a characteristic of Satie's remaining years which was being a part of every progressive movement that manifested itself in Paris over the following years. These movements succeeded one another rapidly. Without doubt in these years Paris was the artistic capital of the world (long before London or New York would achieve much significance in this regard), and the beginning of the new century appeared to have set many minds on fire. In 1910, the "Jeunes Ravêlites," a group of young musicians around Ravel, proclaimed their preference for Satie's earlier work (from before the Schola period), reinforcing the idea that Satie had been a precursor of Debussy. At first Satie was pleased that at least some of his works were receiving public attention, but when he realized that this meant that his more recent work was overlooked or dismissed, he looked for other young artists who related better to his more recent ideas. This was meant to give him better mutual support in creative activity. Thus, young artists such as Roland-Manuel, and later Georges Auric and Jean Cocteau, started to receive more of his attention than the "Jeunes." As a result of his contact with Roland-Manuel, he again took up publicizing his thoughts with much more irony than he had done before, amongst other works, the Mémoires d'un amnésique and Cahiers d'un mammifère. With Jean Cocteau, whom he had first met in 1915, he started work on incidental music for a production of Shakespeare's A Midsummer Night's Dream resulting in the Cinq Grimaces. From 1916, Satie and Cocteau worked on the ballet Parade, which was premiered in 1917 by Sergei Diaghilev's Ballets Russes, with sets and costumes by Pablo Picasso, and choreography by Léonide Massine. Through Picasso, Satie also became acquainted with other Cubists, such as Georges Braque, with whom he would work on other, aborted, projects. With Georges Auric, Louis Durey, Arthur Honegger, and Germaine Tailleferre, he formed the Nouveaux Jeunes, shortly after writing Parade. Later the group was joined by Francis Poulenc and Darius Milhaud. In September 1918, Satie &ndash, giving little or no explanation &ndash, withdrew from the Nouveaux Jeunes. Jean Cocteau gathered the six remaining members, forming the Groupe des Six to which Satie would later have access, but would subsequently fall out with most of its members). From 1919, he was in contact with Tristan Tzara, the initiator of the 'Dada' movement. He got to know the other Dadaists, such as Francis Picabia (later to become a surrealist), André Derain, Marcel Duchamp, Man Ray, etc. On the day of his first meeting with Man Ray, they fabricated Man Ray's first readymade sculpture called The Gift (1921). Satie contributed to the Dadaist publication 391. In the first months of 1922, he was surprised to find himself entangled in the argument between Tzara and André Breton about the true nature of avant-garde art, epitomised by the 'Congrès sur les directives et la défense de l'esprit moderne|Congrès de Paris' failure. Satie originally sided with Tzara, but managed to maintain friendly relations with most players in both camps. Meanwhile, an "Ecole d'Arcueil" had formed around Satie, with young musicians like Henri Sauguet, Maxime Jacob, Roger Désormière and Henri Cliquet-Pleyel. Finally, he composed an "instantaneist" ballet (Relâche) in collaboration with Picabia, for the Ballets Suédois of Rolf de Maré. In a simultaneous project, Satie added music to the surrealist film Entr'acte by René Clair, which was written as an intermezzo for Relâche. Since 1911, he had been on friendly terms with Igor Stravinsky, with whom he would later write articles. Le Piège de Méduse (1913) had a unique position in Satie's oeuvre as it was a stage work conceived and composed seemingly without any collaboration with other artists. Sports et divertissements was a multi-media project in which Satie provided piano music to drawings made by the artist, Charles Martin, composed in 1914 (publication and first public performance in the early 1920s). He got in trouble over an insulting postcard he had written to one of his critics shortly after the premiere of Parade. He was condemned to a week of imprisonment, but was finally released as a result of the financial intercession of Winnaretta Singer, Princess Edmond de Polignac. Singer, who had learned ancient Greek when she was over 50, had commissioned a work on Socrates in October 1916. This would become his Vie de Socrate|Socrate, which he presented early in 1918 to the Princess. From 1917, Satie wrote five pieces that he called ("Musique d'ameublement") for different occasions. Translated as furniture music the term refers to background music played by live musicians. From 1920, he was on friendly terms within circles around Gertrude Stein, amongst others, leading to the publication of some of his articles in Vanity Fair. commissioned by Sibyl Harris. La Statue retrouvée (or "Divertissement"): another Satie-Cocteau-Picasso-Massine collaboration. Mercure: the subtitle of this piece ("Poses plastiques") suggests it might have been intended rather as an emulation of the tableau vivant genre than as an actual ballet, the "tableaux" being cubist, by Picasso (and Massine). During his final years Satie travelled; for example, in 1924 to Belgium invited by Paul Collaer, and to Monte Carlo for the premiere of a work on which he had collaborated. other memorabilia from all periods of his life, amongst which were the seven velvet suits from his Velvet gentleman period. Most importantly, there were compositions that were totally unknown or which were thought to have been lost. They were found behind the piano, in the pockets of the velvet suits, and in other odd places. These included the Vexations, Geneviève de Brabant, and other unpublished or unfinished stage works such as The Dreamy Fish, many Schola Cantorum exercises, a previously unseen set of "canine" piano pieces, and several other piano works, often without a title. Some of these works would be published later as more Gnossiennes, Pièces Froides, Enfantines, and Furniture music). Satie and furniture music: not all of Satie's music is furniture music. In the strict sense the term applies only to five of his compositions, which he wrote in 1917, 1920, and 1923. For the first public performance of furniture music see Entr'acte. Satie as precursor: the only "precursor" discussion Satie was involved in during his lifetime was whether or not he was a precursor of Claude Debussy, but many would follow. Over the years Satie would be described as a precursor of movements and styles as varied as Impressionism, Neoclassicism (music)|neo-classicism, Dada, Surrealism, Atonal music|atonalism, minimalism (music)|minimalism, conceptual art, the Theatre of the Absurd, muzak, ambient music, multimedia art, etc., and as taking the first steps towards techniques such as prepared piano and music-to-film synchronisation. Further, Satie became one of the first musicians to perform a cameo appearance - he was in a 1924 film by René Clair (see: a sample of the film (rm format) and the Entr'acte article). Satie as humorist: many would be surprised to know how many of Satie's seemingly humorous compositions were at heart taken very seriously by him. When he forbade commentaries written in his Partition#Music|partitions to be read aloud, he probably saw this himself as a means to safeguard the seriousness of his intentions. When, at the first public performance of Socrate, there was laughter, he felt hurt. Many other examples of his serious attitude can be found, but there's no doubt that Satie was a witty person, certainly not without many humorous idiosyncrasy|idiosyncrasies. Satie and compositions in three parts: although many of his compositions (e.g., most of the pre-World War I piano pieces) were indeed in three parts, there is no general rule in this respect. After his death, publishers would force more of them into an artificial three-part structure; Satie had actually already made a joke of such proceedings with his seven-part Trois Morceaux en forme de poire, which is French for "Three Pieces in the Shape of a Pear." Satie and (lack of) money: although Satie certainly knew periods of dire poverty, and was perhaps a little uncontrollable in his spending, in long periods of his life he had few worries in this sense. Although maybe not having much money in his pockets, he was (certainly from the second decade of the twentieth century) often invited to expensive restaurants and to all sort of events, and was given financial help, by all sorts of people. Satie as an opponent of other musical styles. The musical styles Satie opposed were allegedly numerous: Wagnerism, Romanticism (Saint-Saëns, Franck, etc. ), Impressionism (Debussy and Ravel), Expressionism (music)|Expressionism (later Ravel), Slavism (Stravinsky), post-Wagnerism (Schoenberg), cabaret music, etc. Apart from some animosities on the personal level (which can be seen as symptomatic of most adherents of avant-garde movements of those days), Satie's ideas on other music of his time generally had more subtlety; for example, about César Franck he could not be brought to write critically, but would avoid the issue with jokes ("Franck's music shows surprisingly much Franckism; Some even say César Frank was lazy, which is not a commendable property in a hard working man"). Perhaps the same can be said as above regarding "Satie as precursor": there is much empty discussion – for example, the debate with Debussy appears to have been over whether or not Satie was a precursor of Impressionism, which would not have made much sense if he had been opposed to Impressionism as such. Vexations: with 840 repetitions of the musical motif (and many more of the melody of the bass), this is definitely the longest single-movement work with a defined number of repetitions (note that, without the repetitions, the actual music takes less than two minutes to play). No explanation by Satie survives regarding the exceptional length of the piece. If excluding the Tango mentioned in the next point, performing the Vexations takes longer than all his other music played in sequence. For Le Tango ("The Tango"), a rather catchy tune from Sports et divertissements, Satie indicates in the score perpétuel (i.e., something like a perpetuum mobile, which in French is "mouvement perpétuel"). There is little indication how Satie understood this "perpetual," apart that at the premiere, at least assisted by Satie, there was obviously nothing repeated ad infinitum, taken literally. When performed for a recording there is seldom more than one repeat of this part of the composition, making it one of the shortest tangos ever, something like a Minute Tango. Five pieces of furniture music, which were intended as "background" music with no number of repeats specified. The circumstances in which such music was performed by Satie himself indicate, however, that the total playing times would be intended to be the usual 'intermission' time of a stage production (see Entr'acte). While the public was not expected to be silent, these compositions can hardly be seen as an experiment in boredom. His music for the film Entr'acte has ten repeat zones in order to synchronise with the 20-minute film (which has a very varied plot, so not much boredom is to be found there either). Recordings of Satie's piano works have been released performed by Reinbert de Leeuw, Pascal Rogé, Olof Höjer, Claude Coppens (live recording), Aldo Ciccolini, Daniel Varsano, Philippe Entremont, João Paulo Santos, Michel Legrand, Jacques Loussier, Jean-Yves Thibaudet, and others. A recording of historical importance is probably Erik Satie, Les inspirations insolites, re-issued by EMI as a 2-CD set, containing among other pieces: Geneviève de Brabant (in a version before Contamine's text had been recovered), Le piège de Méduse, Messe des pauvres, etc. Many other recordings exist: Parade/Relâche (Michel Plasson / Orchestre du Capitole de Toulouse), Satie: Socrate [etc.] (Jean-Paul Fouchécourt / Ensemble), and recordings of songs, e.g., by Anne-Sophie Schmidt. Various composers and performers have made arrangements of Satie's piano pieces for chamber ensembles and orchestras, including Debussy. In 2000, ex-Genesis guitarist Steve Hackett released the album, "Sketches of Satie," performing Satie's works on acoustic guitar, with contributions by his brother John Hackett on the flute. Frank Zappa was also a devoted fan of Satie, incorporating many elements into both his rock and orchestral works. Satie's Scores — by the Mutopia Project. Public Domain Scores by Satie at IMSLP. This page was last modified on 18 August 2017, at 21:02.